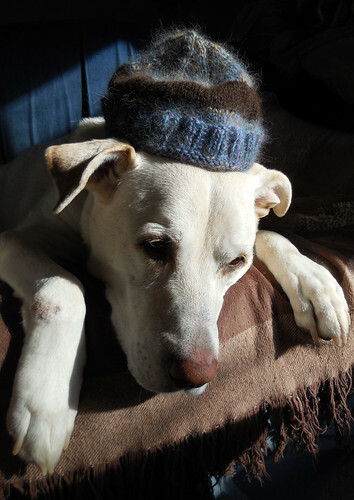 Lapdog Creations: Knitting, Knitting, Knitting! TGIF! I'm not sure if I'm more excited about having some time to knit this weekend, or that we're supposed t0 hit 50 degrees tomorrow. 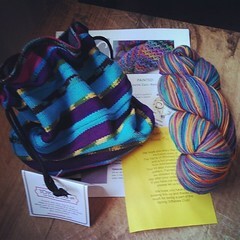 Although it looks like a rainy weekend... which brings me back to the knitting. 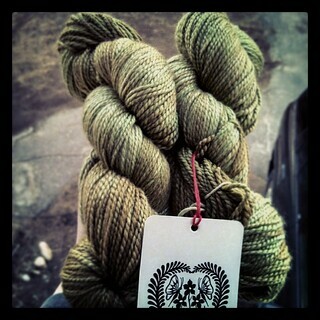 Speaking of which, it's been awhile since I've done a Fiber Arts Friday post, so let's get to it. My needles have been clicking a lot lately, and I've even gotten some projects off those needles! Seriously, do I not have the biggest ham most handsome hat model around? Pattern was my own (80 stitches, K2P2 rib for 1.25"). I didn't have enough of the Puppy Love for an adult size hat and had to rip it back some to put in a stripe of all natural baby alpaca which I had leftover from these fingerless mitts. I should have ripped back a bit more to place the stripe further down, but ah well. 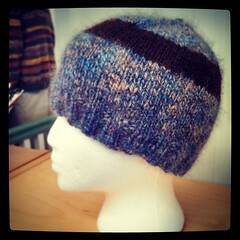 I just wish I had knit it earlier this winter because it is seriously the softest hat ever! I think it's going to be super warm too. 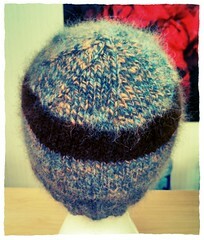 Hat #2. 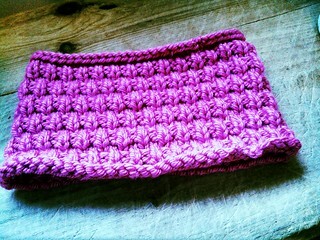 As you may recall, I signed up for a couple of traveling scarves for cancer patients through ConnieCaps.org. I also decided to knit a couple of hats to donate as well using Cascade Cherub Aran, which knits up oh-so-soft and comes in some very beautiful colors. I was thinking spring when I put this one together. 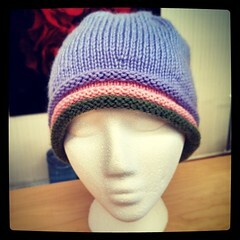 I just started a second one using the pink as the main color, with purple and green in the brim. I hope the colors will bring a little cheer to someone soon. 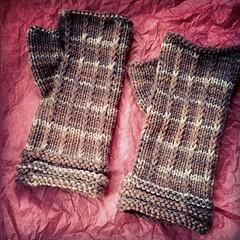 I finally got my Mom's fingerless mitts finished a couple weeks ago. 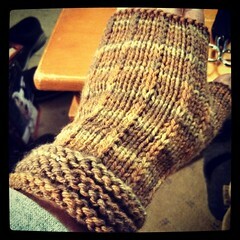 Pattern is Malabrigo Hand Thingies (a freebie on Ravelry) and yarn is Berroco Vintage Colors. My Mom wanted "something brown" and this self stripping worked up nicely. They are a quick knit in worsted weight yarn, however I had to tweak the pattern a few times and rip back one mitt (I still have a third mitt completed that's a bit on the small size - will have to decide whether to knit the mate or just frog it). My notes are my Ravelry project page if interested. 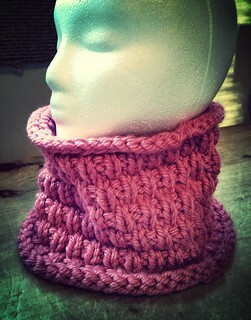 The Snow Cowl was a birthday gift for a dear friend a few weeks ago. It's a very quick knit using super bulky yarn and makes a great accessory! 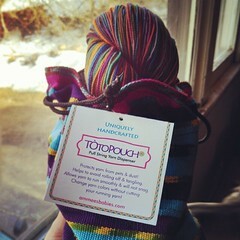 I'll definitely knit more (great Christmas gift idea)! Whew, that's a lot of fibery goodness today. I hope you all have a great, crafty weekend! Our former foster baby Dustee (our first real foster... or at least the first dog we fostered and sent along to a forever home... and yes, I cried for days) had surgery yesterday to remove 3 teeth. 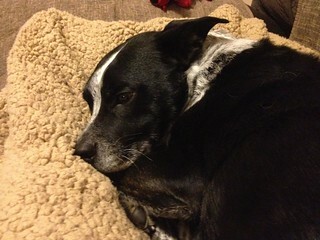 He's at home and recovering comfortably, albeit not very happily from what I understand. Poor baby... please join me in wishing Dustee man well! 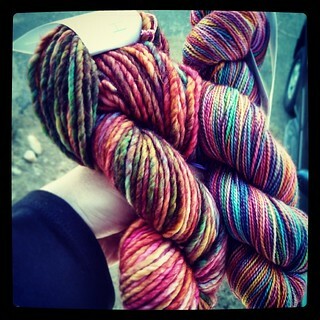 Ohh, that yarn is gorgeous, all of it! Love the mitts, very stylish. I took the Winter Beater out of the garage for the first time since Monday, and the 20 degree warmup meant that my car was 30 degrees, and outside was 50 degrees, insuring that I had to park it for 10 minutes for the moisture to dissipate from the outside and the fog to dissipate from inside. Still, I'll take 50 over 30 or even the 10 it was yesterday morning! Enjoy the temps even if it does rain. You have plenty of pretty yarns to keep you company. 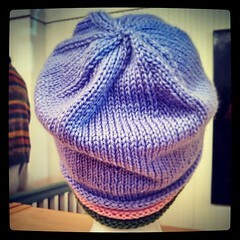 I really like that hat with the triple rows of color at the brim. Is that your own pattern? 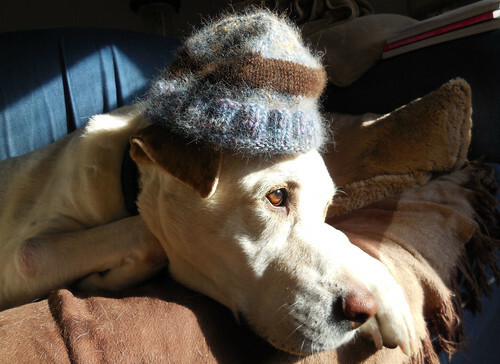 You have been on a knitting kick! Love all of your projects.